The first part of our new multiplayer feature is live and there is so much more to come! As of July 25th, you can unite with other citizens by starting or joining a syndicate. Read all details about this major new game feature in the dedicated blog post. 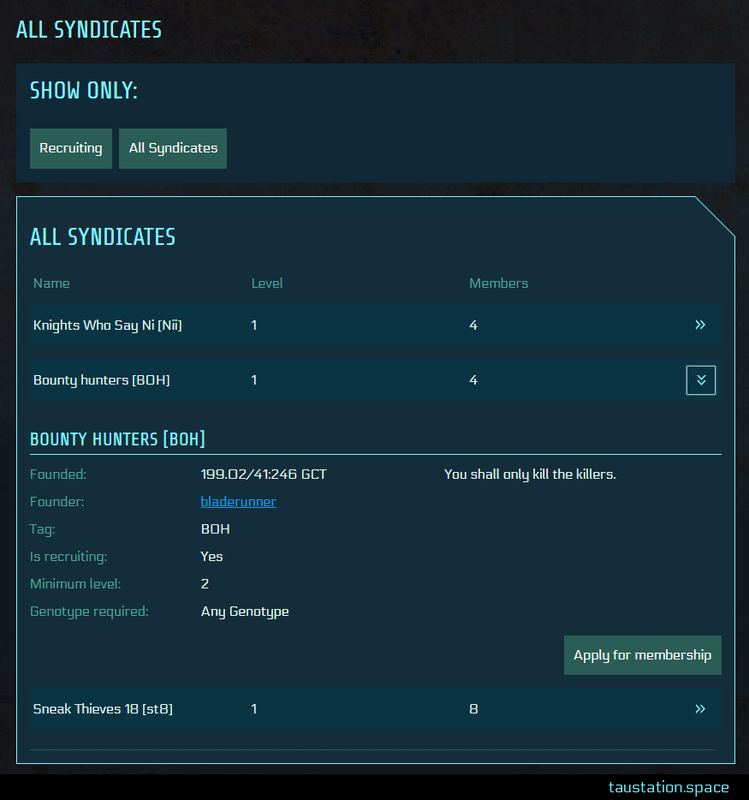 CORETECHS – The new entry Syndicates brings you to your alliance in the case of membership, and it also contains a list of all existing groups. Gov’t Center – In this area, you can now apply for a syndicate licence or support a foundation by giving your signature. 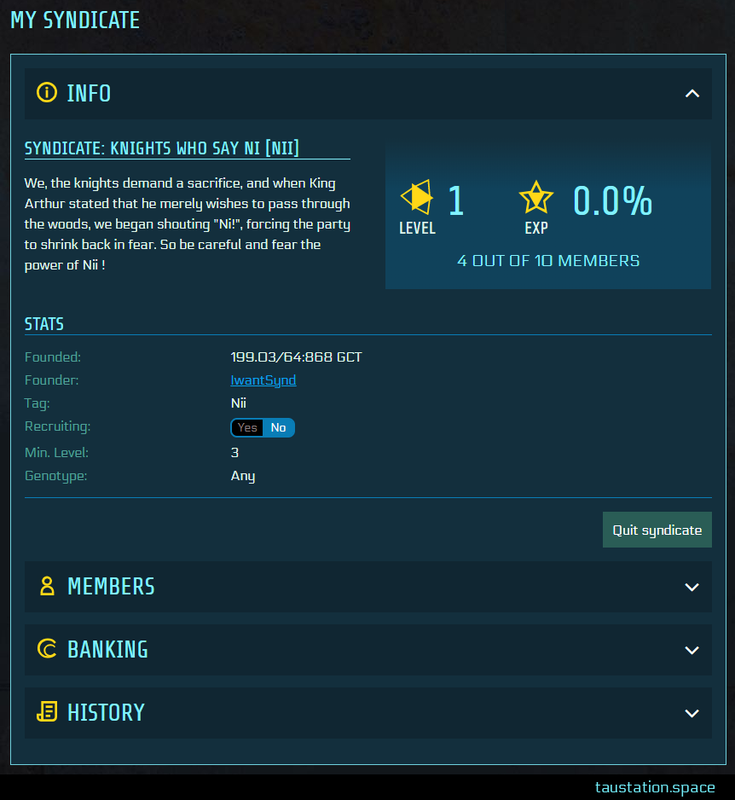 Tag – All members are marked with a unique syndicate tag in chat and profile. University – New courses are now available which are required to found a syndicate. New Mission – “Brinkmanship” is available on Yards of Gadani in the Alpha Centauri System. Some missions need to be completed beforehand; the minimum level requirement is 10. Bashing (punishment) – Attacking and defeating the same citizen more than once in a 24 hour time frame now lowers your local reputation (the more successful attacks, the more it’s lowered). Combat (multiple) – A couple of improvements were added to the combat system, such as: an attacker won’t auto-flee anymore and and only the attacker risks fleeing to the Brig, not the defender (get more details). Prices (reputation & skills) – Your local reputation now has an impact on prices (e.g. for local shuttle tickets), but your social skills can now also lead to price adjustments when buying/selling to vendors. 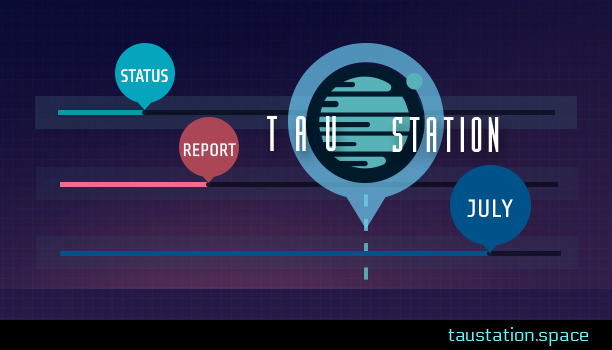 Private Ships (multiple) – In July, a lot was done thanks to the feedback of all the Captains in Tau Station. The balancing has been improved, ships take less damage now, and you get more helpful feedback (get more details). 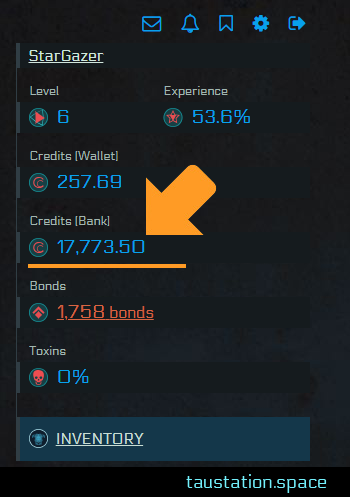 Credits (side bar) – In response to a common Community request, your bank balance of credits is now shown on the side bar, similar to your wallet. Icons (hover tips) – Hovering over icons now reveals a tool tip explaining their meaning. Items (Community) – 5 special items have been added, carrying the names of citizens in homage of their Community Spotlight contributions. Items (new pictures) – 9 items received brand new 3D artworks (bring me to the list). Profiles (weapons) – You can no longer see the “secondary weapon” description when you view another character. Better hope it’s not a BFG! Stims (improvement) – The stat boost items now offer much greater boosts and less toxicity, making them more useful in combat. 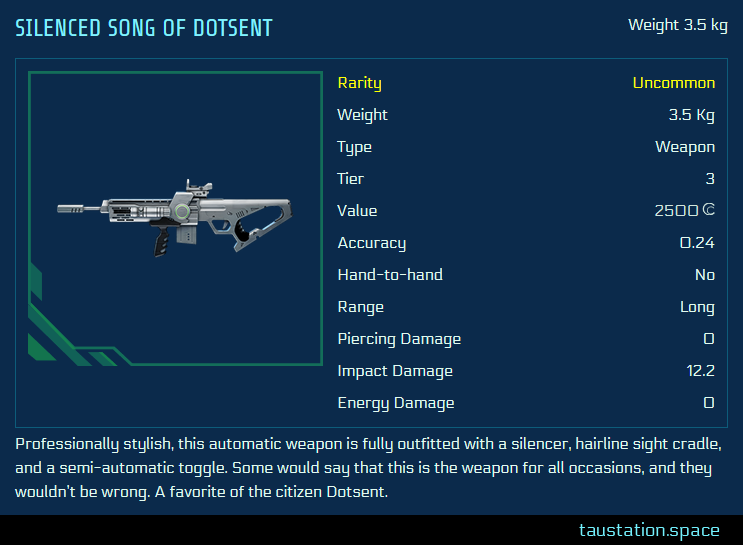 Weapons (types) – Weapon types are now exposed in the detailed view of an item, as this has been a prominent request by our Community. Avatars – Chose your alter ego. 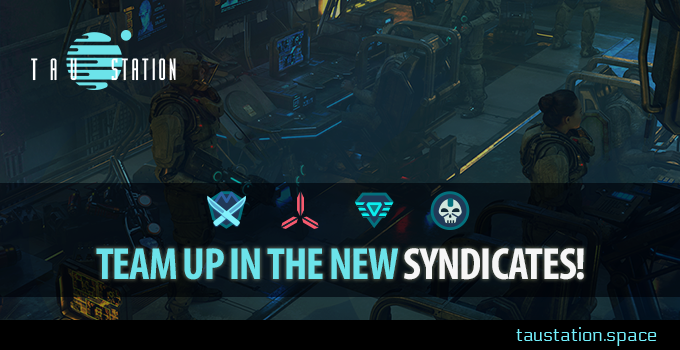 Syndicate Campaigns – Take a challenge with your alliance and enter the maintenance tunnels! 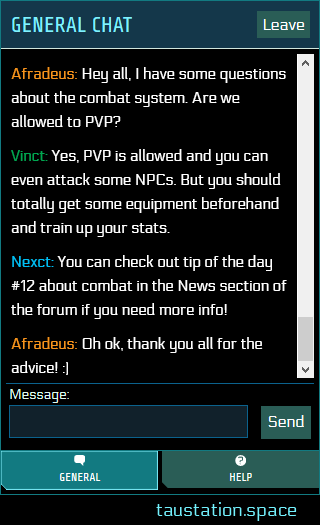 Syndicate Forums – A dedicated section only Syndicate members can access. Syndicate Taxes – You will be able to change it (even down to zero). Missions – UI to show the rewards after you succeeded. Campaigns – Reward popup showing your rewards. Items – Adding new images, e.g. for the new multi stims. Chat – Several improvements and fixes.